As you know, the queries used to find your website in search results can change over time. Your website content changes, as do the needs of all the busy searchers out there. Whether the queries associated with your site change subtly or dramatically, it's pretty useful to see how they transform over time. You might have noticed a new column in the top query listings. Previously we just ranked your query results and clicks. While useful, this didn't really tell you to what extent one query was ranked higher than another. Now we show what percentage each query result or click represents out of the top 20 queries. This should help you see how well the result or click volume is distributed in the top 20. Since we're now showing historical data on the Top Search Queries screen, we figured it would be rude to not let you download it all and play with the data yourself (spreadsheet masochists, I'm looking at you). We added a “Download data” link that lets you download all the stats in CSV format. Note that this exports all query stats historical data across all snapshots as well as search types and languages, so you can slice and dice to your satisfaction. The “Download all stats (including subfolders)” link, however, will still only show query stats for your site and sub-folders for the last 7 days. We've improved data freshness in Webmaster Tools a couple of times in the past, and we've done it again with the new Top Search Queries. Statistics are being now updated constantly. 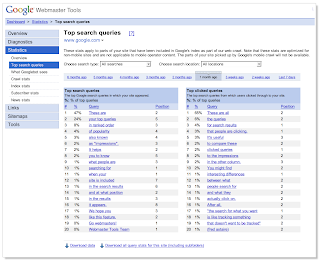 Top query results and clicks may visibly change rank a lot more often now, sometimes daily. So enough talk. Sign in and play around with the new improvements for yourself. As always we welcome feedback (especially in the form of beer), so feel free to drop us a note in the Webmaster Help Group and let us know what you think.